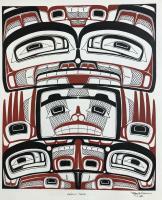 Please phone or email to enquire about framed pieces. 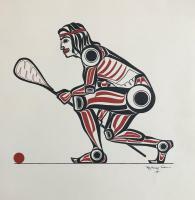 This beautifully painted Lacrosse Player is from 1978 and is one of a number of Vickers originals that have been recently released from Hill’s private collection and made available for purchase. 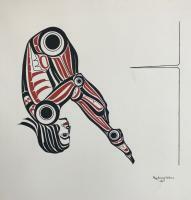 This beautifully painted Diver is from 1978 and is one of a number of Vickers originals that have been recently released from Hill’s private collection and made available for purchase. 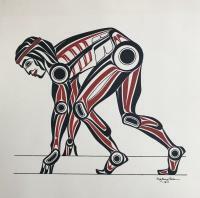 This beautifully painted Runner is from 1978 and is one of a number of Vickers originals that have been recently released from Hill’s private collection and made available for purchase. This beautifully painted Grizzly Bear box design is from 1982 and is one of a number of Vickers originals that have been recently released from Hill’s private collection and made available for purchase. 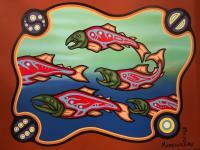 Original painting of a school of salmon with acrylic paints on canvas.